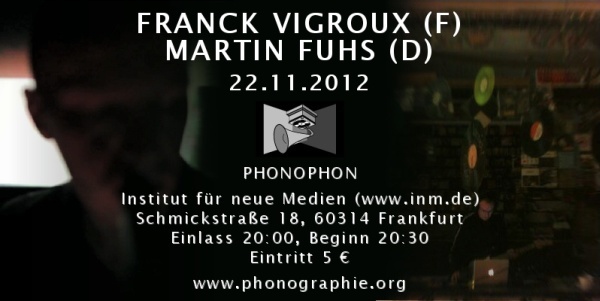 A composer and improviser, Franck Vigroux lives in a universe where rock, improvisation, electronic, hörspiel, and contemporary music meet. On stage he can play many different roles: guitar player, turntablist, electro-acoustician, electronic performer, improvisation orchestra conductor. He also directed numerous videos, such as Dust (30’) in 2007. In 2009 he founded the Compagny D’autres cordes with which he created “Septembres” a text by Philippe Malone, “Broken Circles” for ten musicians interpreted by Ars Nova ensemble instrumental, and “Un Sang d’Encre” with Marc Ducret (2010). In 2011 he composed “D503” a piece for Radio France ACR which runs for Prix Italia 2011. Roland Etzin präsentiert Tonträger des Frankfurter Labels.